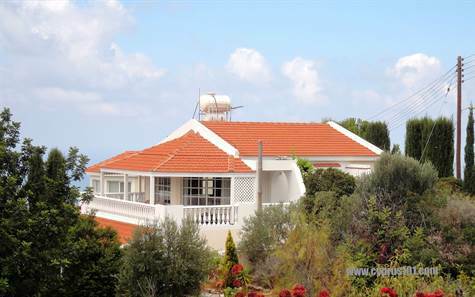 Cyprus Property Blog by Cleo : Stunning Tala Villa for Sale - Great Location & Price! Just listed. Tala, Paphos - This impressive luxury villa with superb sea views is located in Lofos Tala, one of the most sought after neighbourhoods within easy reach of Paphos and the coast. Being custom built, the design and finishes are completely unique and the property is in excellent condition. The living room is light and airy and divided in distinct areas; lounge, formal dining area, kitchen and utility room. Featured at it’s centre is a staircase leading down to a large hallway, which is currently used as a study area and guest accommodation. On each side of the hallway is a double size bedroom with fitted wardrobes and modern en-suite bathrooms. The beautifully landscaped garden with 8m x 4.5m heated swimming pool can be accessed directly from both bedrooms and the central hallway via patio windows. The garden is very private with a covered veranda providing a shaded area and plenty of space for relaxing and outdoor entertaining. The property is ideal as a permanent residence or holiday home and can easily be converted to a three bedroom property, using the space in the lower hallway. To the front is a gated driveway and to the side, a designated green area which cannot be built on. Please refer to MLS#: 1195 when inquiring.